Exhibit 3-27 shows several plotted lines representing the different minor movements at an unsignalized intersection. The dashed horizontal lines near the bottom of the graph identify the estimated potential capacity for both the minor street left-turn movement (shown as a yellow dashed line and depicting the northbound left-turn from Krome Avenue onto Okeechobee Road), and also the major street left-turn movement (shown as a green dashed line and depicting the westbound left turn from Okeechobee Road onto Krome Avenue). Both of these capacity estimates are based on the projection that there will be a conflicting volume of about 2,010 vehicles during the peak hour for the first stage of the minor street left-turn movement (see Exhibit 3-25). Exhibit 3-27. 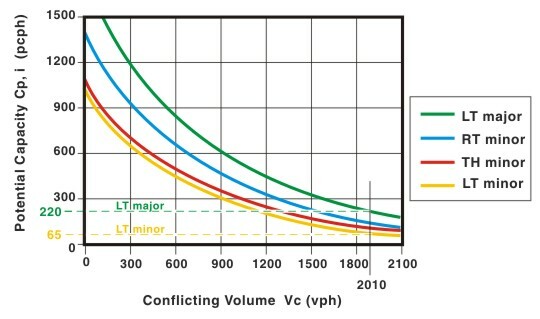 Potential capacity of a stop-controlled movement as a function of the conflicting traffic volume. (Source: HCM Exhibit 17-7). The minor street (northbound) left-turn's estimated capacity of 65 vph is considerably less than the peak hour demand of 257 vph, confirming the capacity deficiency we observed in the photo. Conversely, the estimated capacity of the major street (westbound) left turn (220 vph) appears sufficient to accommodate the peak hour demand of 120 vph.